It means “welcome to the happy ranch” and they mean it! 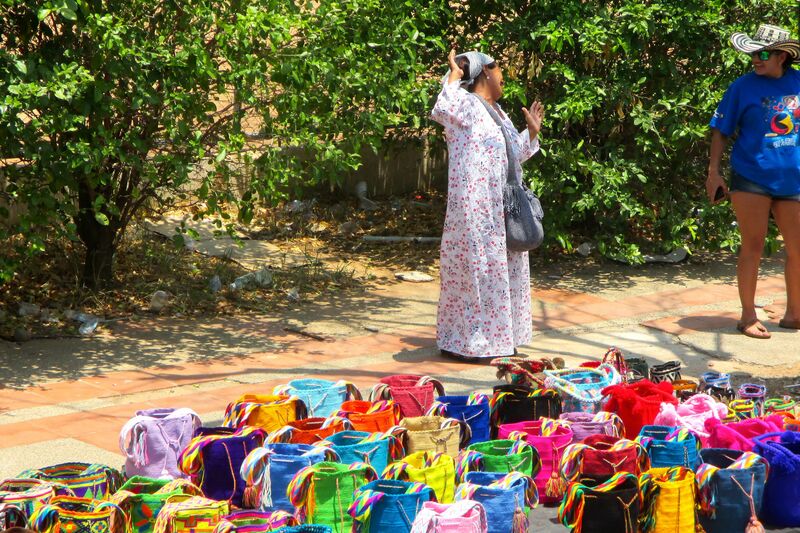 Of the many wonderful things there are to note about Colombia, one that bears repeating is its universal love of festivos and celebrations, when most people take at least an extra day to relax and have fun. Learning several days prior that the 48th Annual Festival Vallenato was being held the weekend of April 30th in beautiful Valledupar, Cesar, there was no question about what travel plans to make. Leaving Barranquilla… look at that super green tierra! My WorldTeach Colombia 2014 host and hermana Colombiana, Marina, is originally from Valledupar and has always encouraged me to visit her home town for its rich culture, gorgeous landscape and … of course…Vallenato. I bought it on the bus for $1000 COP. I figured it was fate. After an 8 hour bus ride which left Cartagena at 6:45 am, connected in Barranquilla, and concluded the last two hours without air conditioning, thirty or so sweaty people, most wearing sombrero vueltiaos and drinking water from little plastic bags, rolled down country roads, and finally arrived in Valledupar. At the Terminal de Transportes, I was greeted by a young woman working with the Governmental Department of Cesar, who encouraged me to take a free tour organized by the city for this year’s festival, and presented some post cards and a map highlighting adventure spots in the area. Do you think she secretly knows there is no tour? Another new adventure in itself is the online community, www.couchsurfing.com, which so far has connected me with friendly travelers in Cartagena. Arranging the week before to stay with hosts from couchsurfing.com went well for this trip to Valledupar. My first host, Darwin, greeted me at the terminal and swept me away to his stunning home on lush green land nearby. We enjoyed making patacones together and talked about travel, music and cooking. Darwin told me some history of Valledupar and the surrounding areas. Around 8:00 pm, he dropped me off for a gran concierto featuring several Vallenato and Champeta artists. It immediately began to rain very hard. Three women from Medellin called out to me, “Gringa, estas sola? Ven, ven aca!” Taking me in with them, we waited out the downpour under a palca with several police officers and concert workers, as the waters rose around us and the ground turned into a giant mud pond. After the rains subsided, we were escorted to seats near the front of the outdoor theater, where artist after artist took the stage accompanied by a slew of backing musicians. For several hours, Churo Díaz, Mr. Black and El Zorrillo, Kvrass, and Martin Elias with Rolando Ochoa all performed. Martin Elias was perhaps the most impressive, with his infectious energy, tight showmanship and resounding voice. The son of late Vallenato superstar Diomedes Diaz, Elias sang each song with precision and enthusiasm, clearly an artist born to a legend, but who stands on his own when performing in concert. Leaving the show in the early morning hours meant sleeping until noon, after which Darwin and I said our goodbyes from Centro Comercial Guatapuri, where my Colombian boyfriend Juan Valdez served a generous cup of his delicious coffee, before leaving for the free tour promoted by the Department of Cesar. Unfortunately, the tour never happened. 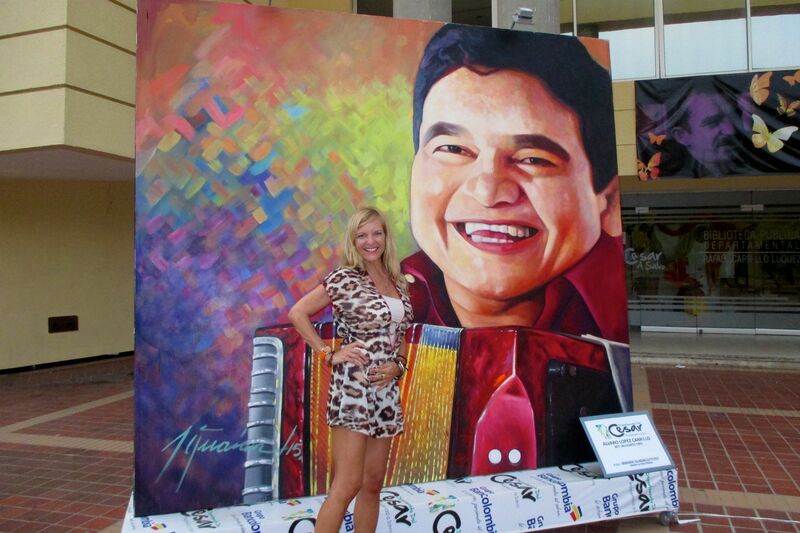 Arriving at the biblioteca meant finding many beautiful paintings of Vallenato artists outside, but no tour. A group of disappointed visitors complained outright when a two-level bus arrived from Banco de Bogotá, not the Department of Cesar, and did not have a tour to offer. Great painting! Now where’s my free tour? Recognizing two women from the Cartagena bus, Mariela and Indira, we agreed the tour was a bust and took a taxi together to the centro, where we enjoyed listening to music among a huge crowd in the Plaza Alfonso Lopéz. Soon after, my second Couchsurfing host, Luis Fernando, arrived to take me to a street party of friends and family. As we arrived, the birthday guy happily exclaimed, “una gringa para mi cumpleaños? Gané! ” (A gringa for my birthday? I Win! ), as his wife (the party hostess) handed me a large platter of birria y bollo (goat and corn buns). Being a polite vegetarian, I ate the bollo, and Luis Fernando graciously snuck the plate of birra back into the house. Saturday morning, determined to see the city from the top of an open tour bus, Mariela, Indira and I met again outside the biblioteca, where a large bus arrived, this time reserved for Banco de Bogotá employees and their families. Indira explained to the driver we had waited most of yesterday afternoon for a tour that never happened. The driver replied it was not his decision to only include Banco de Bogotá employees and their families. Still, we stood firm, determined to get on that bus. 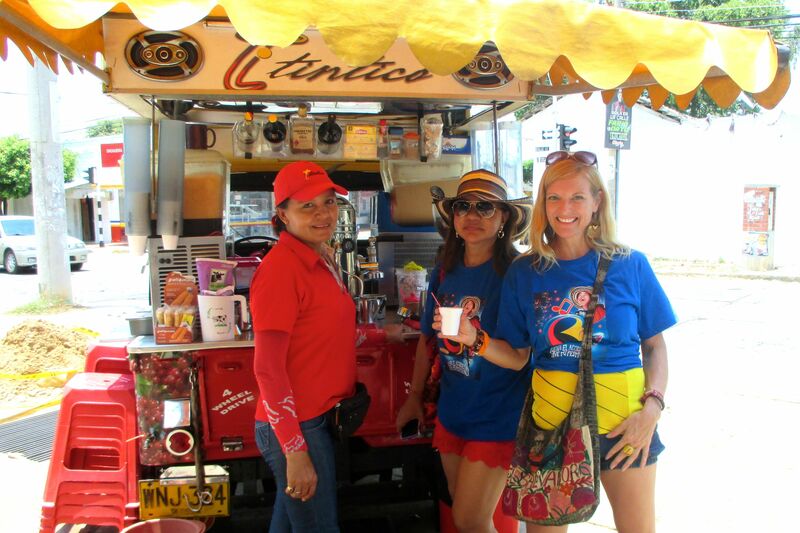 Eventually, Mariela, Indira and I were given t-shirts like the employees were wearing and invited on the bus. The camaraderie, hospitality and fun among these Banco de Bogotá employees was incredible. We danced on the sidewalks by the Parque Mercado Artesanal. We danced in the parking lot near the Rio Gutapuri. We even danced on the second floor of the bus while it was moving, ducking to avoid treacherous mango tree branches and low-hanging utility wires. In fact, the Banco de Bogotá group was so lively and fun, we danced more than we sat, and still saw the entire city from the top of the bus. Mission (of fun) accomplished. Following favorite traditional, delicious Colombian lunch of fried fish, patacones and arroz de coco, Luis Fernando chauferred a driving tour of the popular statues and landmarks of Valledupar. We stopped at each monument, taking photos and reading about the history of this diverse and creative city. In the evening, Luis Fernando recommended a nearby space that had been turned into an outdoor discoteca-vallenato fusion dance club (yes, more dancing). As the DJ mixed songs from Alkiados and Kevin Florez with Peter Manjarrés and Carlos Vives, cerveza Club Colombia, who sponsored the event, switched out icy buckets of cold beer for thirsty dancers. The next morning, the streets showed evidence of revelry, waking slowly, littered with paper plates, beer cans and cups, and workers who rose early to clean up the festive mess. Boarding a bus back to Cartagena for eight hours, the sound of Vallenato still lingering, I watched from the window as the coast of Colombia rolled by, arriving home in the evening to catch a moto from the terminal de transporte and get a good night’s sleep. The following day, I asked my 11th grade about their weekend activities, and the students asked about mine. The plane outside of Barranquilla… almost home! At the student’s suggestion, we played the song over the classroom speakers, just loud enough for those next door to hear we were having fun and learning English. As I watched them singing and dancing, reaffirming this country’s love of festivos and celebrations, I once again felt grateful for being in Colombia. Even when teaching seems too difficult, the air makes it too hot to breathe, or dancing until 5 am is simply exhausting, I’m reminded that life – no matter where you live or what you do – is truly all about what you make it. You can choose to be sullen and dark, focused on all that you can’t get through, or you can choose to smile and celebrate until you find the silver lining. Or, in Colombia’s case, the gold that shines brilliantly, like a giant accordion statue in the middle of Valledupar. Gracias por todos, Valledupar, te quiero mucho! Que gusto da leer tu blog,es muy dinamico y muy alegre… Me hace sentir como si estuviera viviendo esas experiencias en vivo!! La cancion de Silvestre Dangond, “La Gringa”, esta muy Buena…Espero bailarla contigo en C/gena. What a pleasure it feels reading your blog, it is a very happy and dynamic reading…It makes me feel, like if I was there, living those experiences myself!! Hope to dance with you Silvestre Dangond’s song, “La Gringa”..
Si Myriam, Colombia es una pais increíble! Estoy feliz de conocerte pronto en Charleston.